This post is sponsored by Behr Paint Company but all thoughts and opinions are entirely my own. If you’ve been a follower for a while then you know my blogging roots started in painting and repurposing old furniture- hence my blog name 😉 But as we moved into nicer apartments and I had the opportunity to decorate more, I slowly started falling in love with interior design. 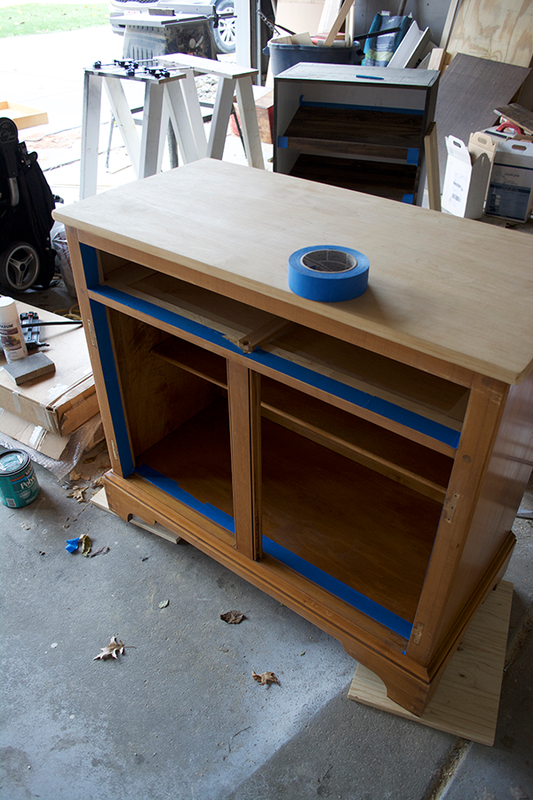 Even though I don’t paint furniture much anymore if I ever get the chance to do it, I jump right back in. 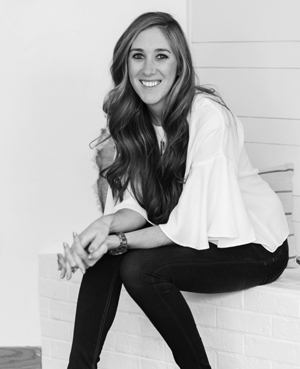 That’s why I was so excited when Behr asked me to be a part of BEHRBox this year, a mystery box challenge focused on Behr’s 2019 Color Trends. 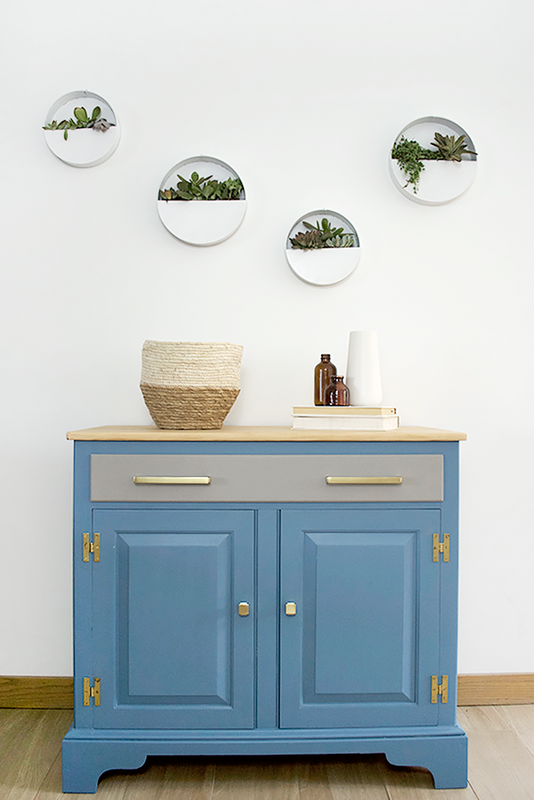 They sent a fun box of goodies, paint and inspiration and I was challenged to create a weekend project using their 2019 Color of the Year – Blueprint S470-5. 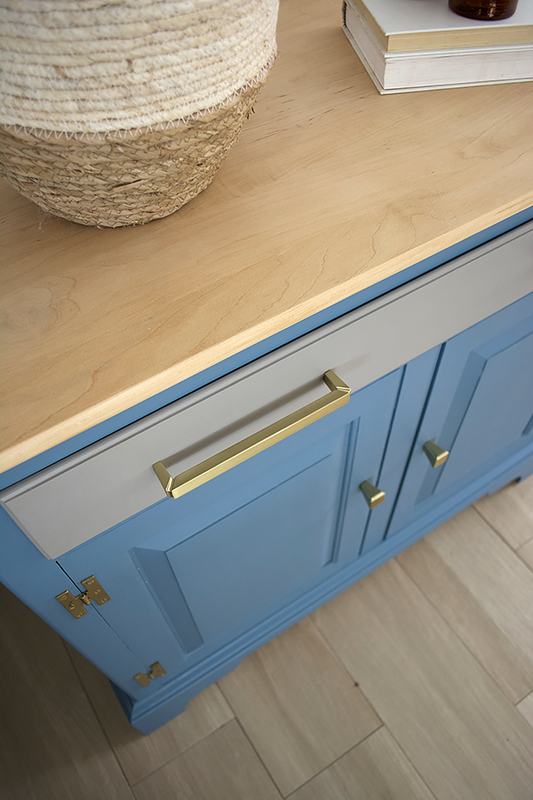 One of the things in my box was some gorgeous brass hardware from Liberty Hardware and I immediately knew I wanted to paint a piece of furniture and give it a new life. 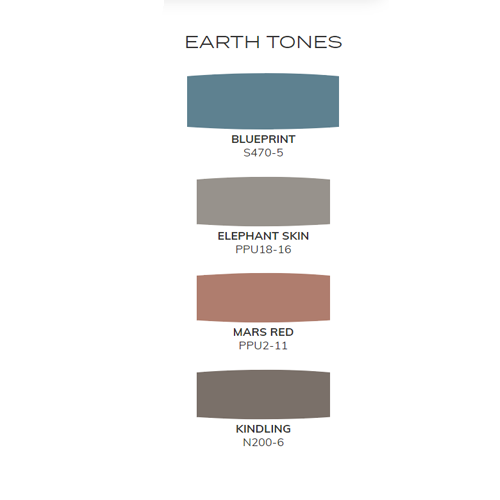 I was also challenged to use one other color from the Down to Earth 2019 Color Trends Palette and I decided to use Elephant Skin PPU18-16 – a beautiful grey. So first things first, I needed to find a piece of furniture! I used to have so many old pieces laying around our house, when I told Dan I needed to go find one he responded by saying “we don’t have any around here?”. That just goes to show you how things used to be 😉 I decided to head down to our local Habitat Restore which usually has some great old pieces with good bones, and it didn’t disappoint. 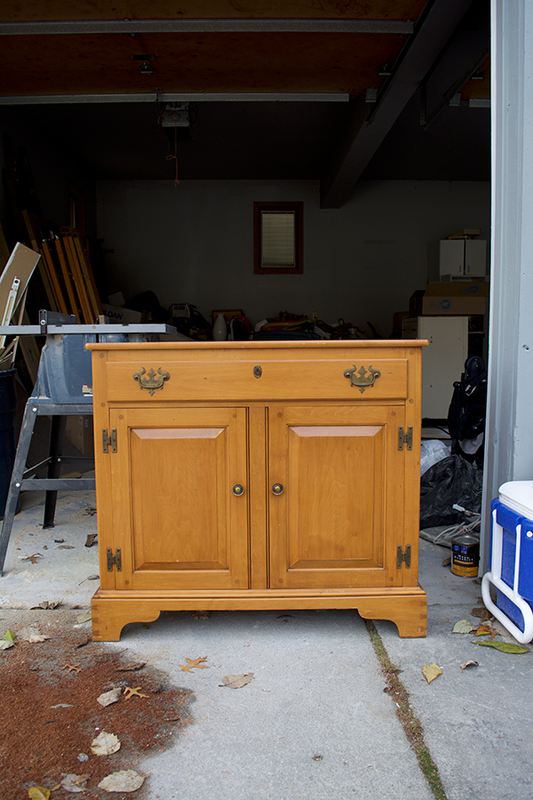 This piece was solid and in great shape, just a little dated with that orangey oak color and rusty hardware. I scored it for $40 and it fit perfectly in the back of my car so obviously it was meant to be. It just had some minor chipping on the top. I wasn’t sure what my plan was going to be but right away I wanted to smooth out the top so I grabbed my corner cat sander and got to work. 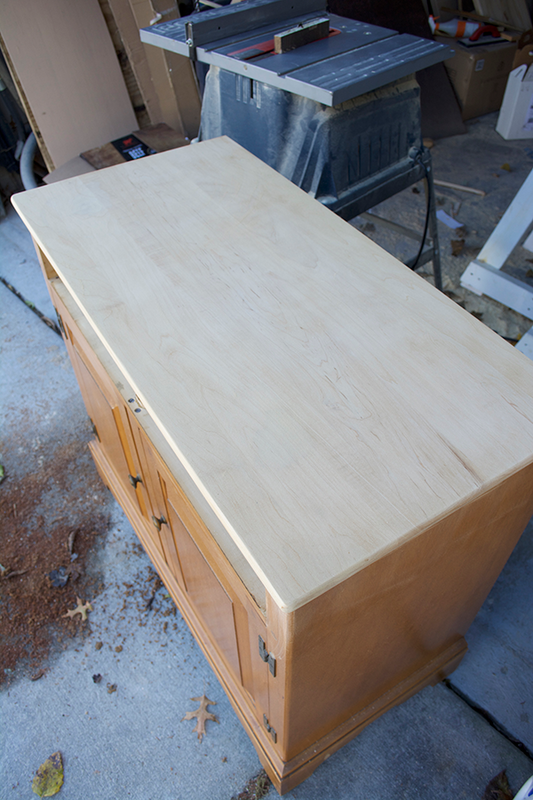 You never know how a piece of furniture is going to be, but the top layer sanded off SO easily and gave me such a beautiful raw finish. I’m usually a dark stain girl, but this was just too pretty to do anything with so I decided to leave it as is and just seal it up with some wax. 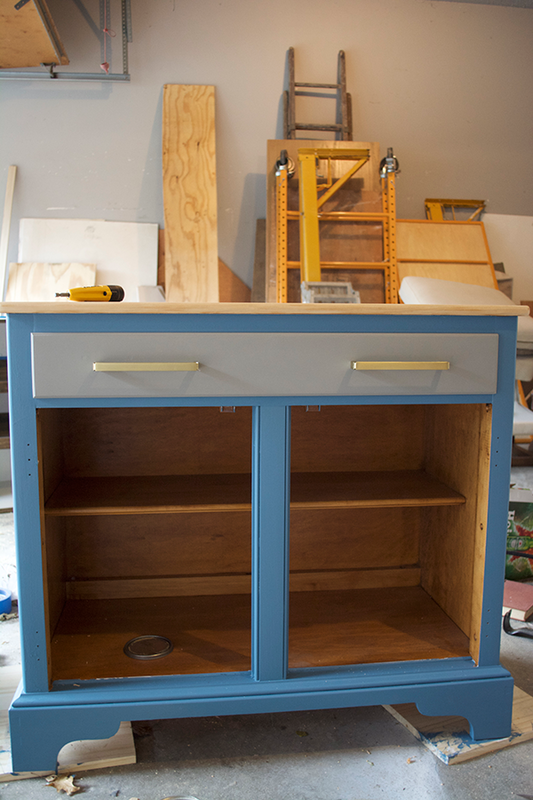 Before painting any piece of furniture you want to remove all the old hardware and fill in any holes you don’t plan on using with your new pieces. I just used some wood putty and then used my sander to sand it down once it dried. 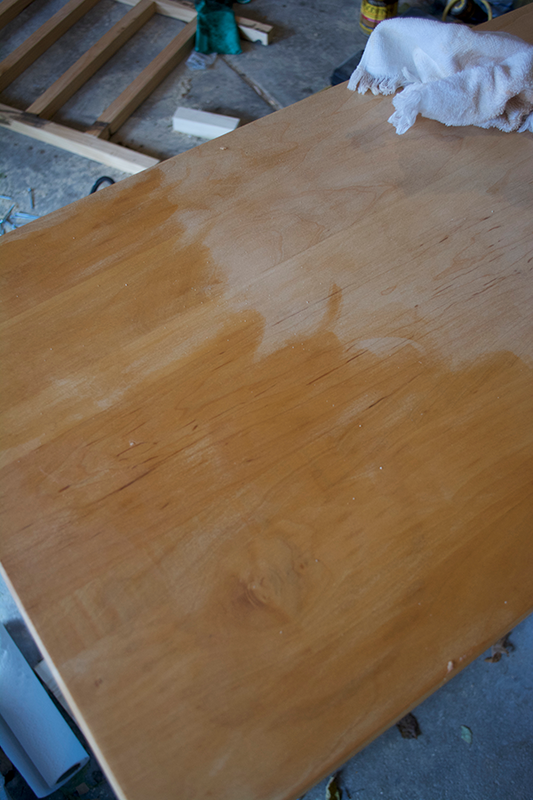 After you’re done, you want to give your entire piece a good sanding just to get any dirt or yucky stuff off. I used an 80 grit sanding block. Then you can tape off any areas you don’t want to get paint. Once your piece is all taped up you can prime it. 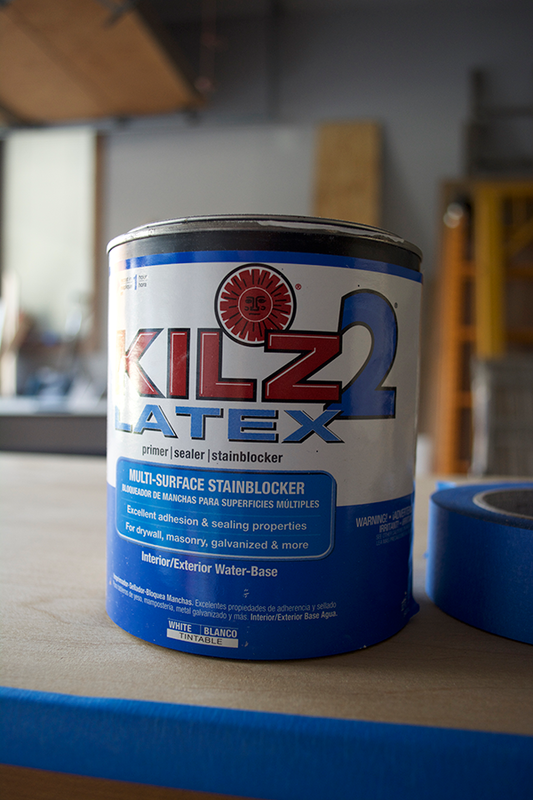 I used KILZ2 ® – LATEX Primer and applied one coat. Once your primer dries you can start to paint! 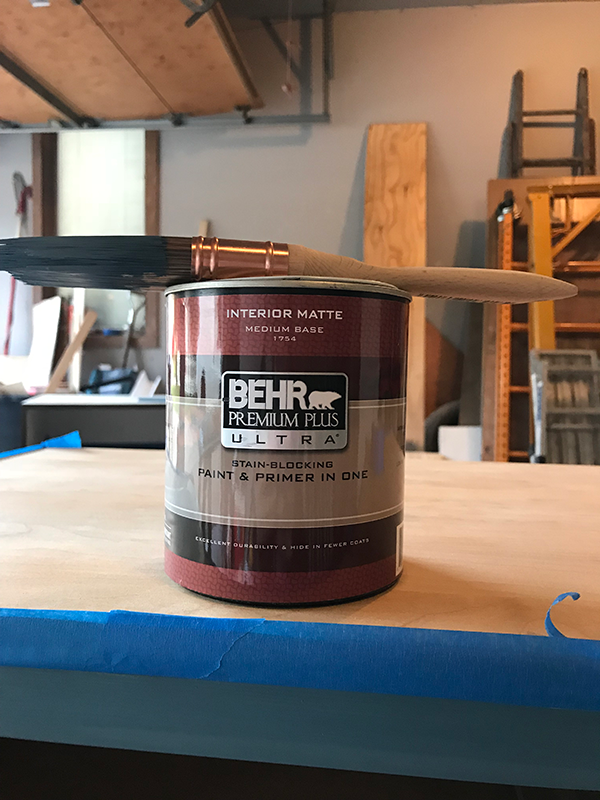 I grabbed a quart of Blueprint S470-5 in BEHR PREMIUM PLUS ULTRA ®- Interior Paint in a matte finish. Make sure you have a good quality bristle brush – this will make a huge difference in how your paint goes on. 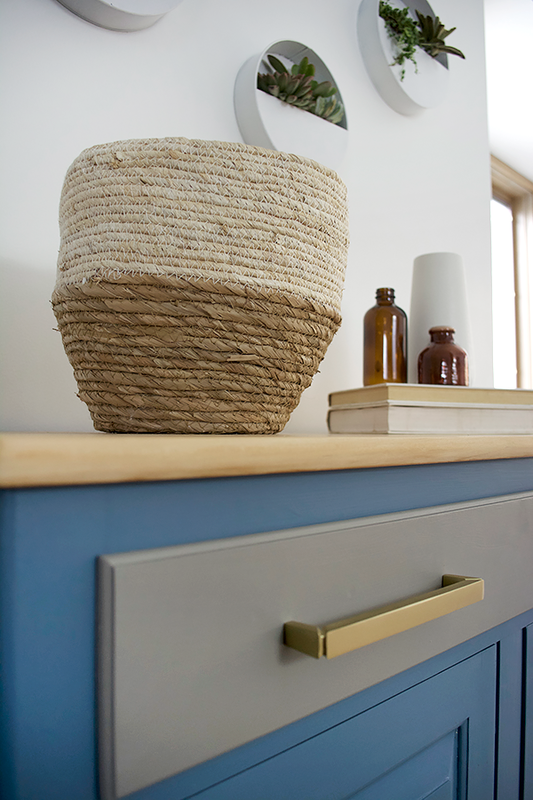 I decided to use Elephant Skin PPU18-16 on the top drawer to break up the blue a little bit – plus the hardware looks so beautiful against that soft color! Now for the show stopper – the hardware! 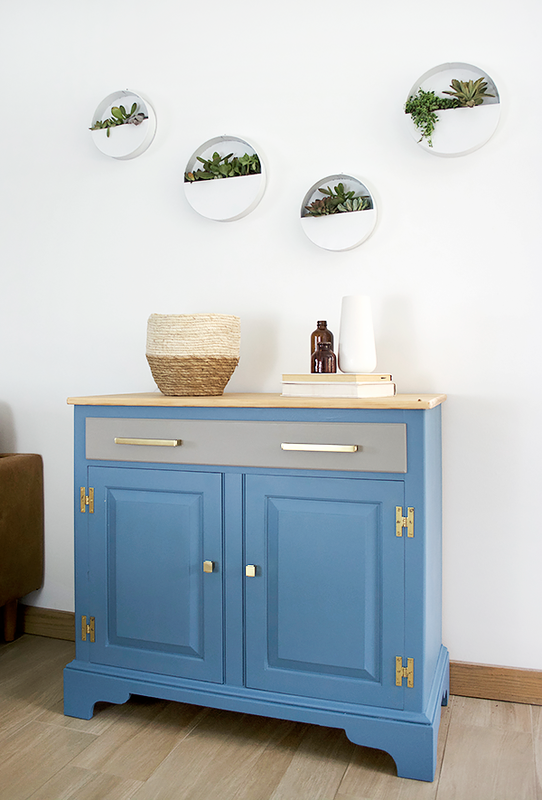 They’re from Liberty Hardware and add the perfect modern touch to this piece. I did decide to keep the old hinges and to update them, I spray painted them with some gold spray paint. 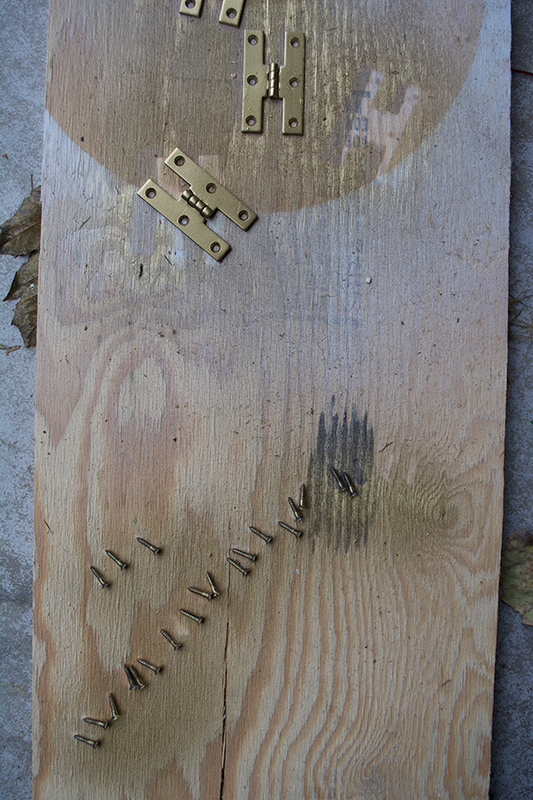 I also sprayed the little screws since they would be visible as well. 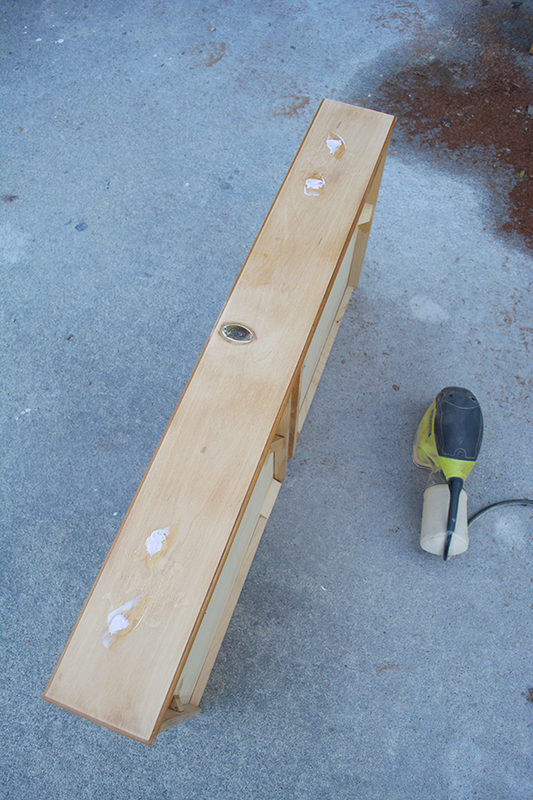 If you have to drill new holes for your hardware – I have a little trick for you. 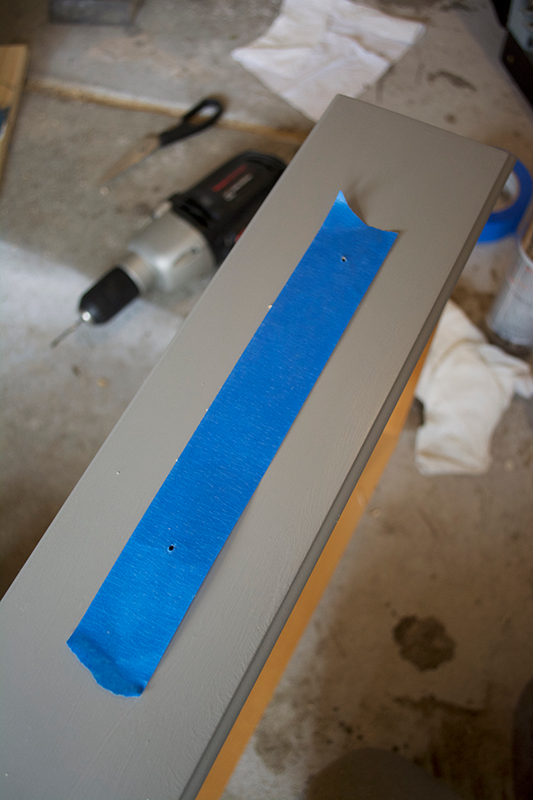 Place a piece of painters tape on the back of your pull and poke holes through each spot you’ll need to screw into. Then just place your tape on your drawer and mark with a pen or something sharp where your holes are. And voila! 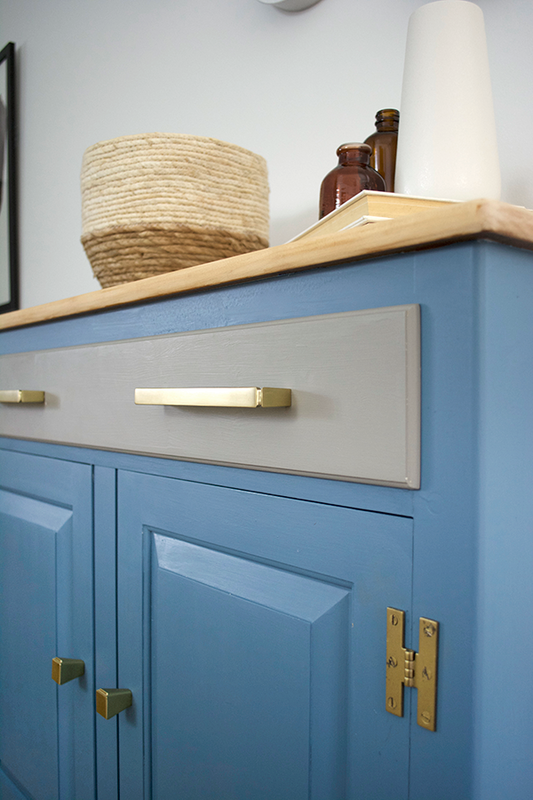 Perfectly straight drawer pulls. The last step is to seal your piece. 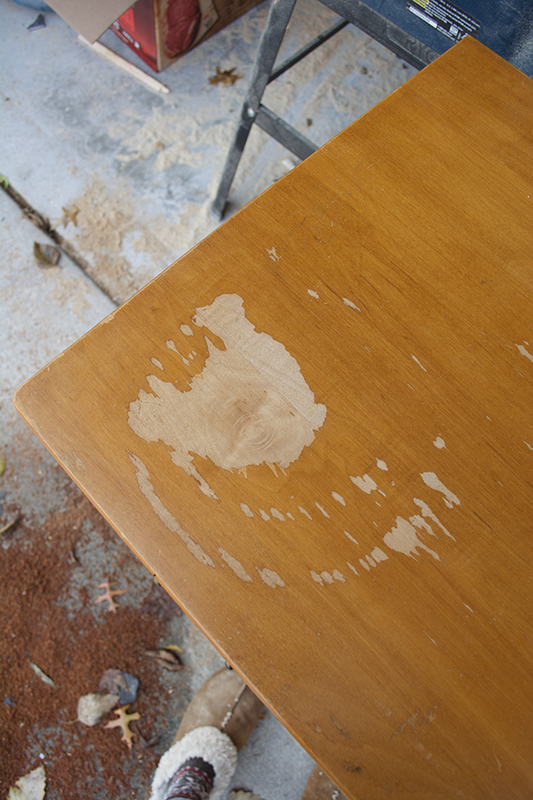 I found over the years I painted old furniture, that I didn’t like the way brushing on a finish looked. I could never get it completely smooth and it always looked streaky. My favorite products ended up being waxes and wipe on polishes. I had some finishing wax left over that I used on our coffee table recently so decided to use it on this piece as well. You just apply it with an old rag or towel – I usually use an old sock – and rub it on in a circular motion. After you’ve gone over it once, you can go back and buff it off – again in a circular motion and it leaves a beautiful hard and smooth finish. I used it for the top as well and as you can see, it looks like it makes it yellow, but once it dries, it’s completely clear. And that’s it! I usually keep things pretty neutral around here but it was fun to play with a brighter color and switch things up! I’m not sure where I’m going to put this piece yet but it’s perfect for some added storage! 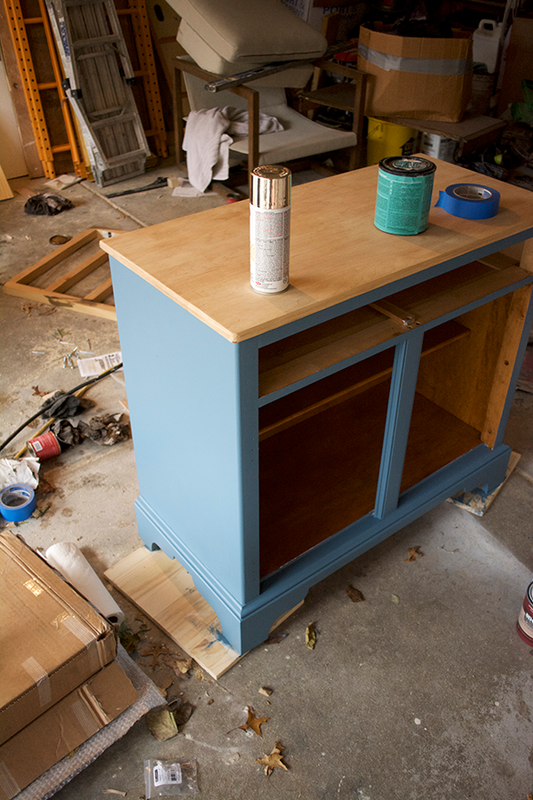 It was so fun getting back to my furniture painting roots and freshening up something that most people would just look over. There’s something about seeing a transformation like this that makes me so happy and reminds me why I started doing it in the first place. I definitely lean towards more wood tones pieces these days, but I still believe there’s always a piece of furniture that could use a little paint and a little love. 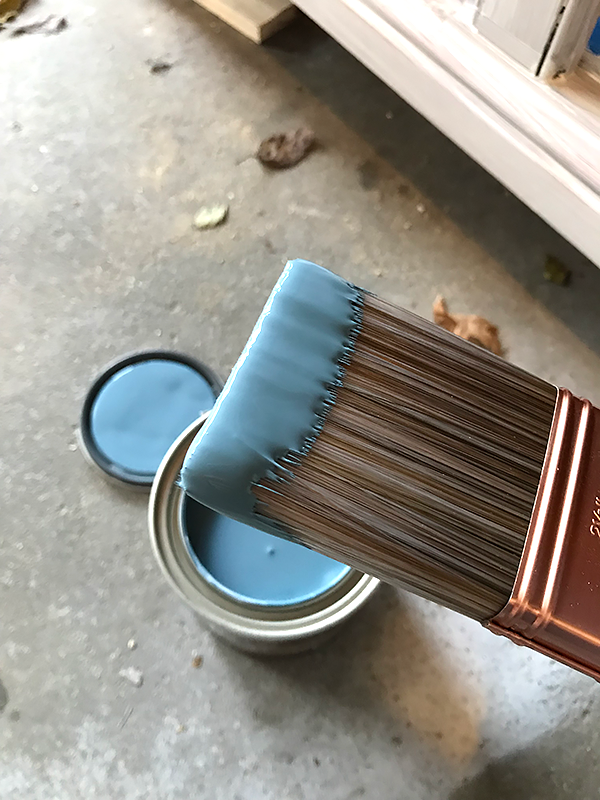 You can find Blueprint S470-5 and the rest of the 2019 Behr Color Trends palettes at The Home Depot and get started on your next weekend DIY today. 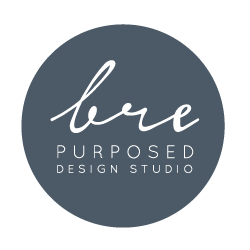 To view my project and other BEHRBox project challenge reveals, click here and vote for your favorite for a chance to win one of four $250 gift cards to The Home Depot! The BEHRBox Sweepstakes opens on 11/12 at 12 p.m. PST and runs through 11/30 at 11:59 p.m. PST. Thank you so much to Behr Paint Company for sponsoring this post and inviting me to be a part of the BEHRBox Challenge! That is freakin’ amazing. You are very talented and inspiring. Thank you! I love the color choice. 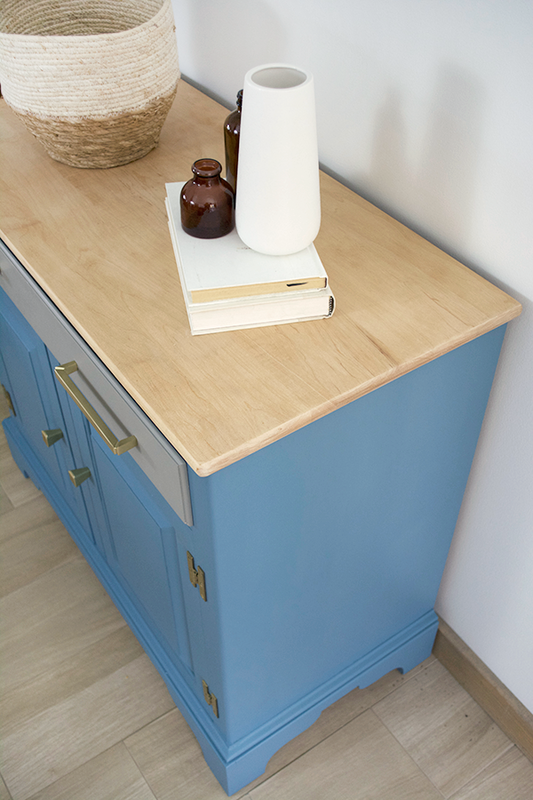 I want to refinish my French bedroom set in a blue like this. Omg! 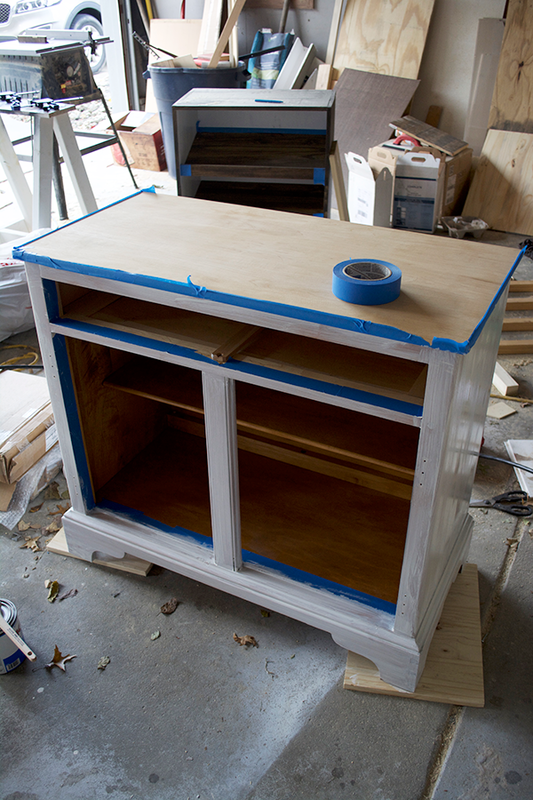 The wheels are turning my head with inspiration after seeing how you gave this piece of furniture new life. Yay! Happy to help inspire you! I am so not crafty. But you did a beautiful job. I LOVE this piece! Thank you so much Judy!! What a beautiful way to breathe new life into an old piece. The gold hardware really glams it up without being too over the top! Thank you so much Karin! !